If you are just popping in for the first time around here I will let you in on a little secret, we are expecting baby number two in July and I am just about killing myself to transition my 2.5 year old out of the nursery before that time comes. 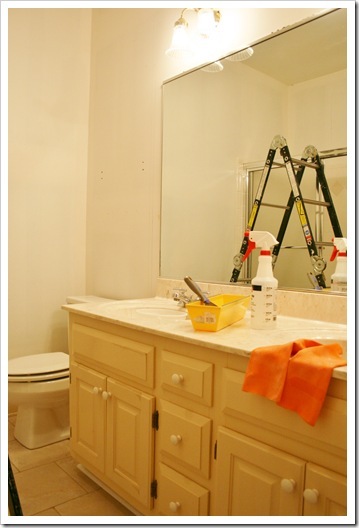 I had already planned to update our guest bathroom during the first quarter of this year, along with our kitchen. Unfortunately the looming due date made for a tough reno and pushed back any work on the kitchen until probably some time next year. Wah-wuh… In the meantime I am still working at full throttle, well as full as my big belly and lack of decent energy will allow, to get the “big boy” room together and the nursery girlied up a bit! 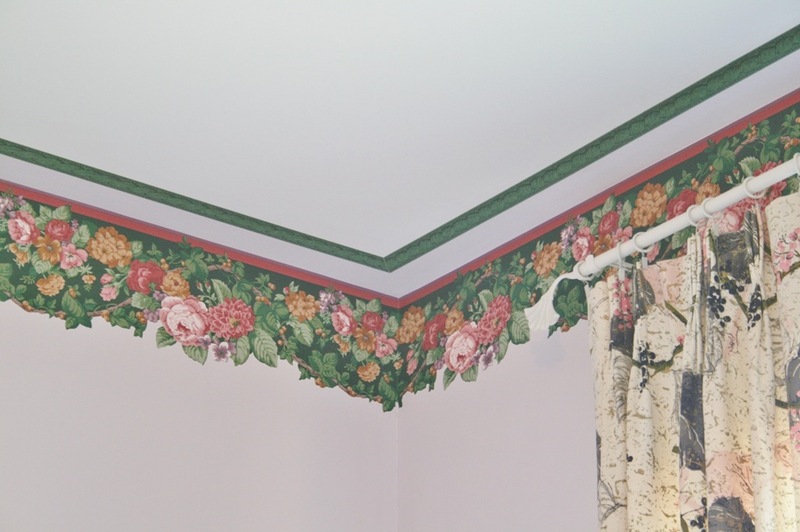 This lavender and cream boudoir boasts a lavish (and I’m sure early ‘90’s Waverly) floral border worked into a faux “tray” style ceiling detail. 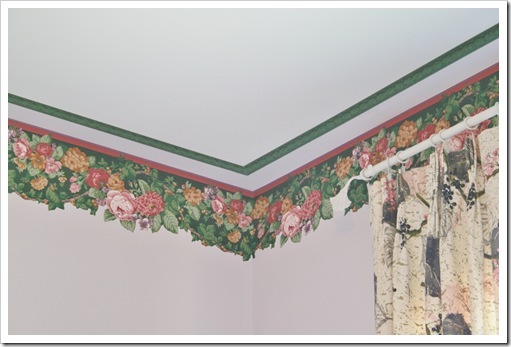 Meaning the lavender was also painted along the edge of the ceiling and another portion of the floral border was laid along the edge of that painted line and around the ceiling. Ooooh, lovely! Actually, in all fairness I’m sure this was a nice look at the time and I am also sure the original owners spent some cash to have this treatment done to create this effect. Let’s just say, it’s really not for us…especially the little boy who is about to move into the space. 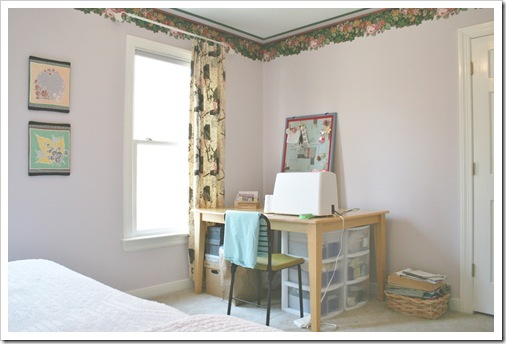 Not only did this room serve as extra sleeping space for our guests, but the wall opposite the king sized bed housed my sewing and craft nook. 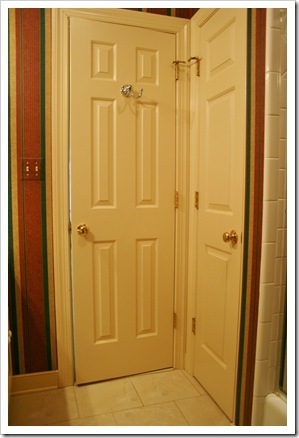 You can also see the edge of the door to the little walk-in closet, known as the fabric stockyard, in the shot above. I will fully admit this room was decorated with whatever I had on hand that I felt could make it work for the time being. 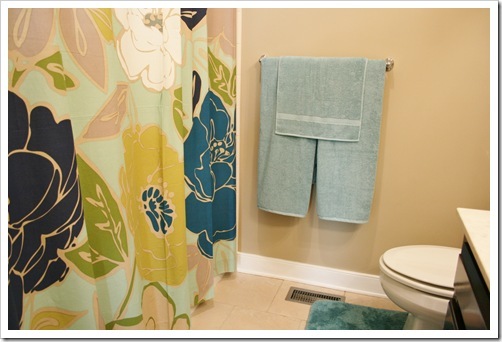 In decorating the space I felt more than a little trapped by the color scheme and floral details. 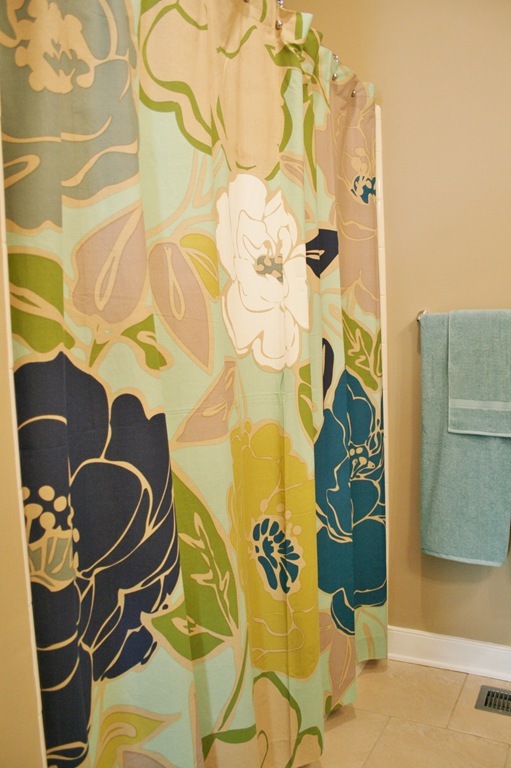 Heck, even the curtain rods had gingko leaves on the ends, which are nice, but still not the look I was going for in the space. 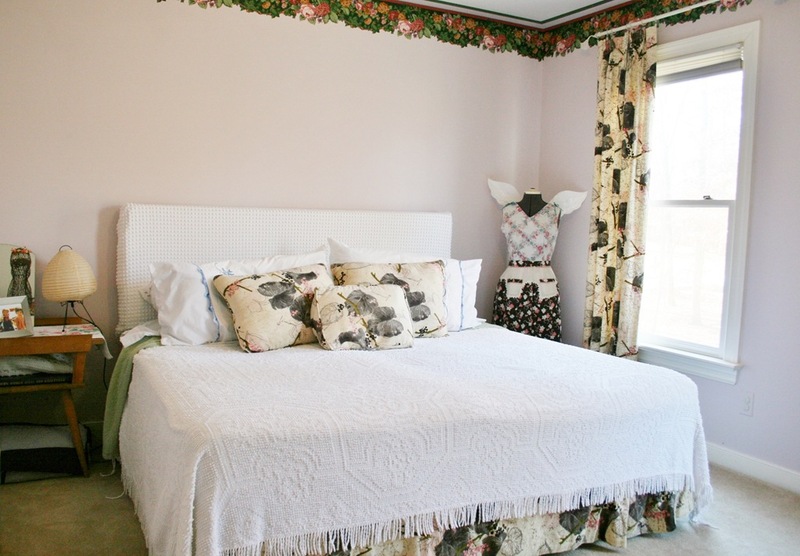 The headboard consisted of a large piece of foam, originally purchased to create cushions for another nixed project, covered in a vintage dotted coverlet. 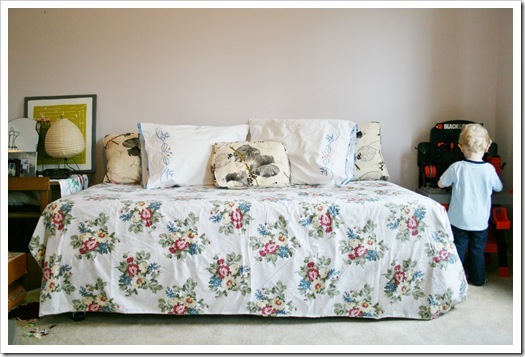 The large patterned barkcloth pillows, bed skirt and curtains were all vintage finds that seem to always get pulled out whenever I had a room that needs something to pull it together on zero budget. 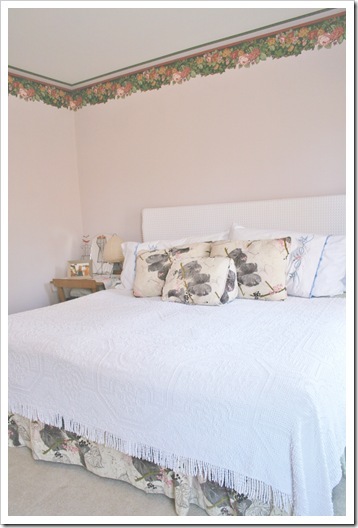 I used extra pillows covered in vintage hand-embroidered pillow cases and another vintage coverlet to finish off an admittedly very out of character feminine look. The side table, another vintage find, was topped with miscellaneous craft/sewing room décor from previous houses, a clock radio and some family photos. On the other side I stored my dress form, covered in vintage clothes. Over time, some of my creations ended up being pinned up on the walls, not only to keep them from being damaged while awaiting a buyer from my Etsy Shop, but also for my enjoyment until they left for a new home. This room would be perfectly straightened up, as evidenced by these photos, for all of about 20 minutes before a new idea would hit and I would have piles of fabric and supplies chaotically strewn across every inch of useable bed, desk and floor space. I enjoyed using this room, as did several guests, but it was time for a change that the Little Guy was anxiously awaiting. 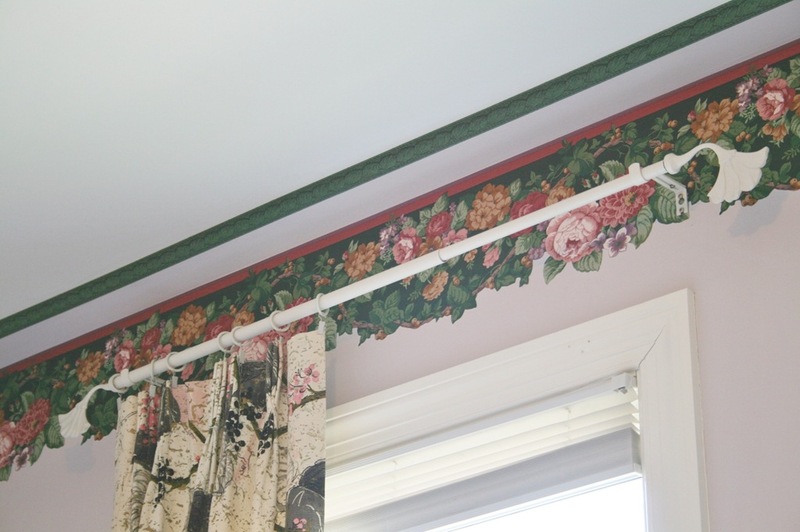 Over the course of the last few months I had tested the border to see how “stuck” it really was and just like the guest bathroom wallpaper, it came down easily and within minutes. 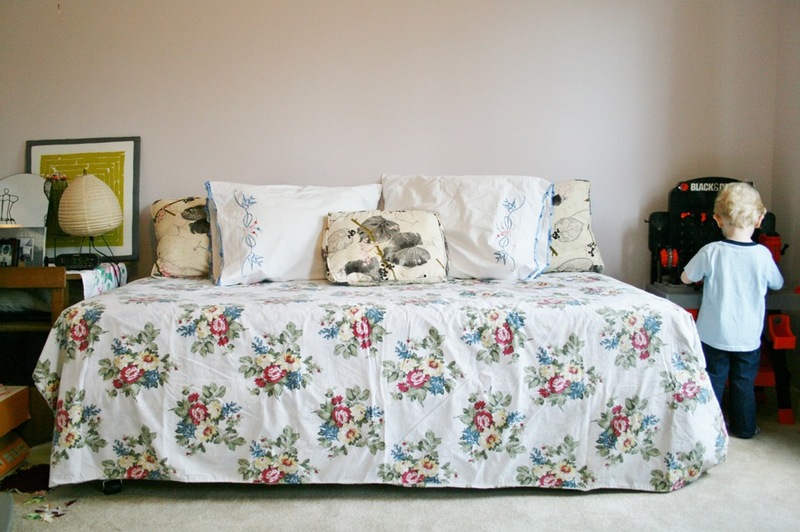 The Mister had talked me into moving one of the twin beds that had made up the “king” sized bed for this room, into the playroom for more comfy seating and to attempt to get me off the “I want a sectional” nagging bandwagon. I will admit it’s better than the numb buns you get from sitting on the futon, but it only delayed the sectional talk for about a day. Sorry dear! In the meantime, I had made up the other twin into a day bed we could enjoy until the real work started in the “big boy” room. As you can see above, more toys had also been moved from the playroom into this space to help keep the Little Guy occupied on the occasions when I had to do some sewing for business. Nothing like a mini tool bench to keep a kid happy for, oh, ten minutes. Am I right? As of today, the room has been cleared of everything, accept this bed and the floor has been covered in protective plastic. The band of lavender along the ceiling got a first coat of primer and tomorrow I hope to tackle priming the most dreaded piece of this room to paint – oil-based painted trim!!!!! UGH in SEVEN LANGUAGES!!!! I am being lazy and praying that a good oil-based primer will solve my problems, but this could be the breaking point for the timeline of this mini-makeover. I will keep you all posted on the success of that combo as I go along. 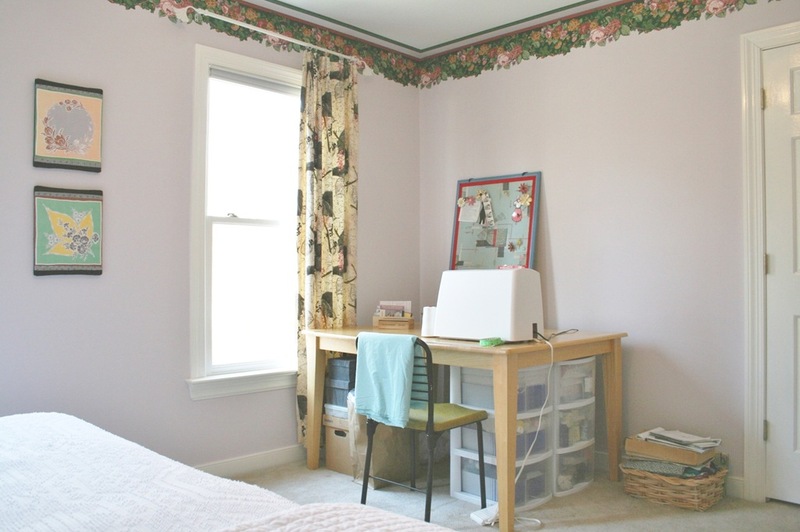 -Take the lavender to light gray, with a white ceiling and white trim. 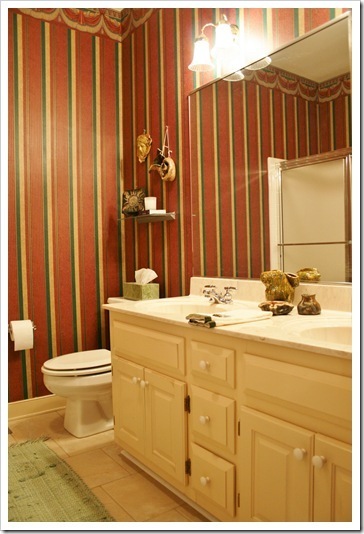 -Add horizontal stripes in a gray just a couple of shades darker than the other walls to the main bed wall. 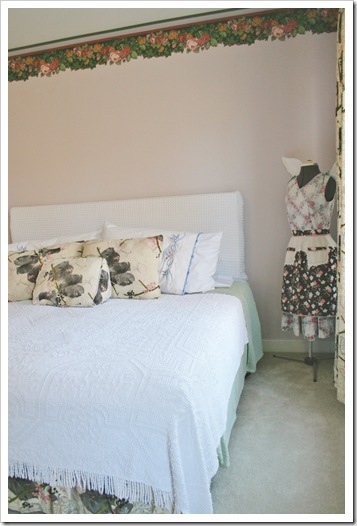 -Add already purchased simple bedding in gray and newly created bed skirt in a tweedy fabric. 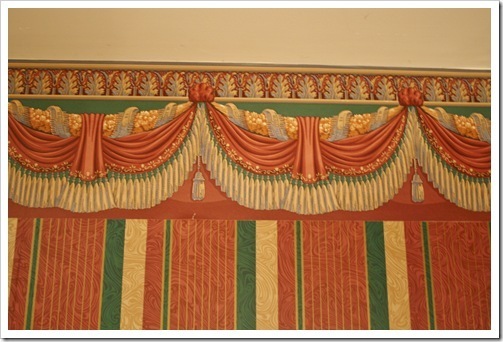 -Spruce up the windows with some thrifted, but new, curtains that I plan to customize with a patterned fabric border. -I hope to customize the Little Guy’s IKEA desk and chair set to be placed on one wall. 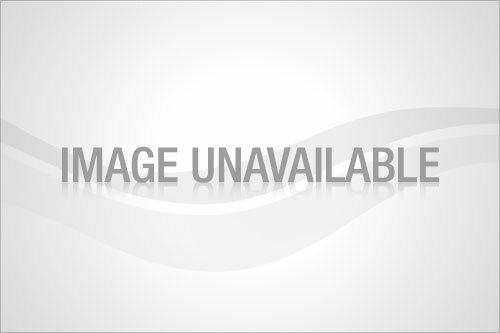 -Add a magnetic chalk board above the desk area. -Add an already purchased large, family-sized beanbag chair. -Clean up and paint an already purchased thrifted shelving unit. 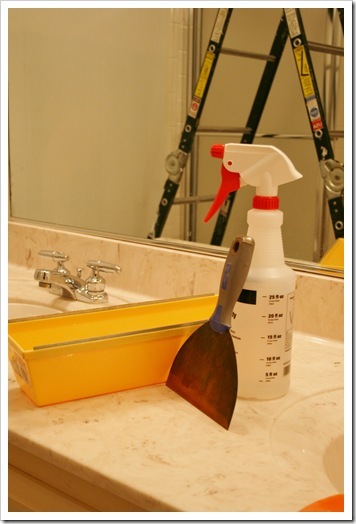 -Find a small dresser for the space- clean up and paint as necessary. 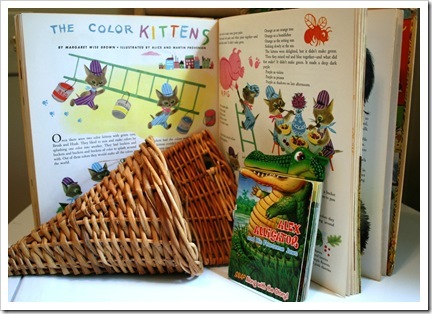 -Add artwork and pillows in fun colors (primarily orange, the Little Guy’s fav!) against all the gray. -Working on a possible A, B, C’s letter wall. 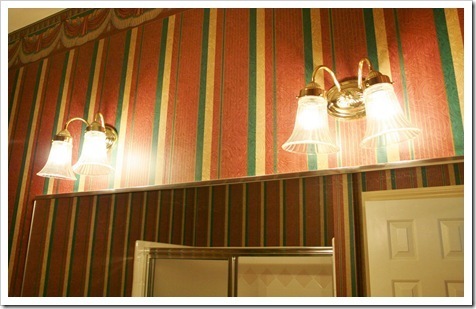 -Add brightly colored paper lantern lighting over the bed, if possible. -Find something to use as a nightstand. 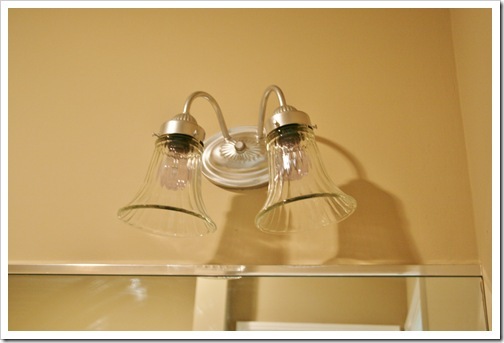 -Change out current light fixture in the center of the room for anything that isn’t brass! -DIY a larger rug for the desk area from some thrifted rugs. I’m sure I will think of more things to do as I go along. For some reason that’s how it seems to go with any project I do for my kid. I just want to do more, add more, get everything I think is cute or that he might like. It’s a sickness really and I’m sure it doesn’t get any better as you add to the flock. Stick around and I will add photos as things progress. Please wish me luck in getting all this done, too, before we end up with one more family member to love! Finally! 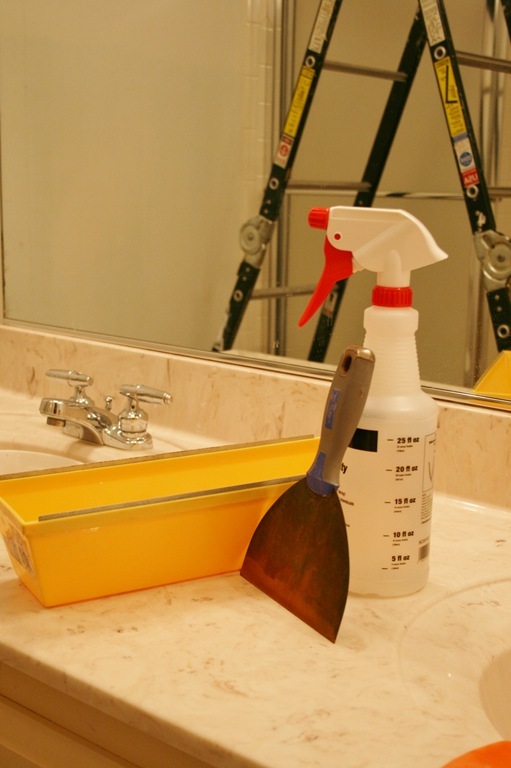 I am ready to show off my handy work in our guest bathroom. This one definitely felt like it took longer than it really did. 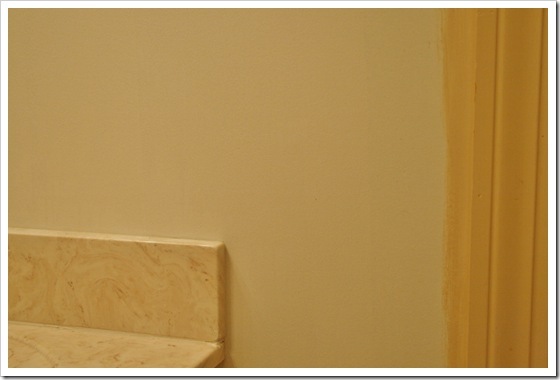 Unfortunately any time you work with stain you have to add in a lot of extra days just for drying time. Anywhoo, the walls are no longer wrapped in striped paper, the cream door, trim and cabinet color have been obliterated and the hardware is donning a new coat of “chrome”. 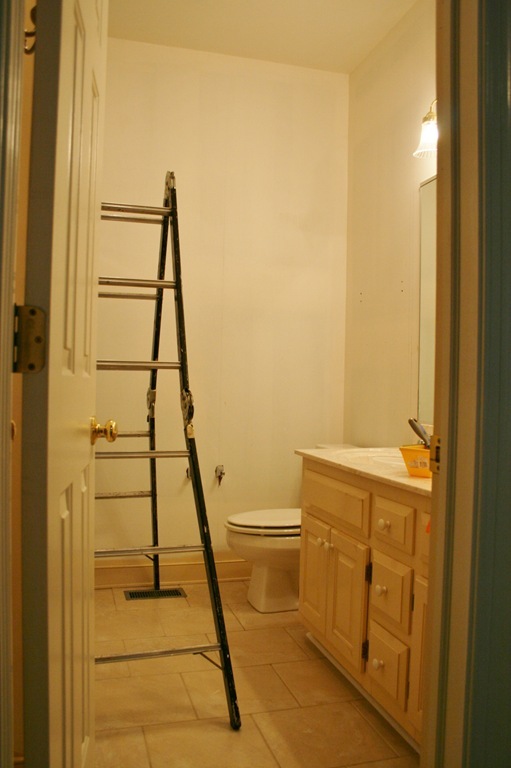 Oh yeah, I removed the shower door, added a rod and curtain, and painted the lights too! Whew! So we now have a pretty generic box, but it does feel a lot better in this bath to us now. It will take some time to add more personality, as in some cool art for several walls, but I like to take my time with that sort of thing. 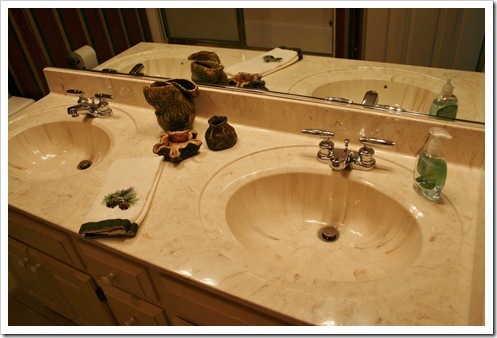 The water damaged cabinetry has a new lease on life and the faux marble vanity top looks less reddish brown than it did with the previous color combination. 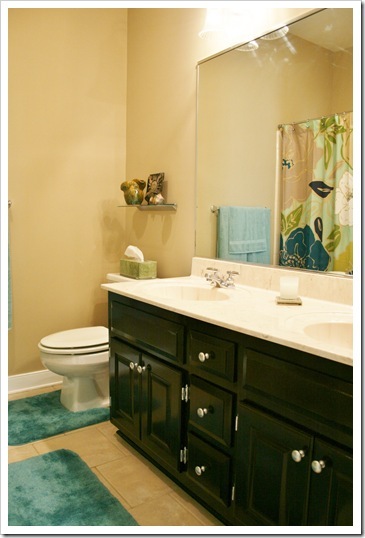 This bath ties in better now too with the guest bedroom it is attached to. 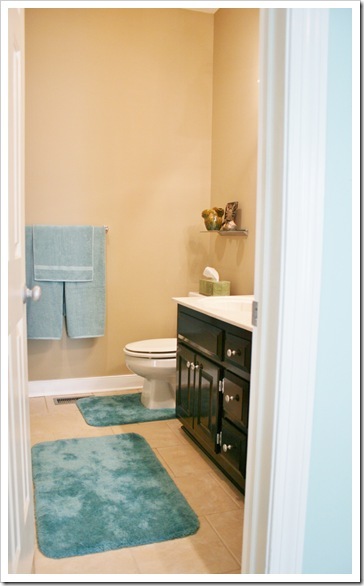 I left a sliver of the light blue wall color showing in the first before and after shots above so you could see the odd original transition from the bedroom to the bath. Now, with modern colors the rooms don’t look like they are from such vastly different time periods. I think (and hope!) 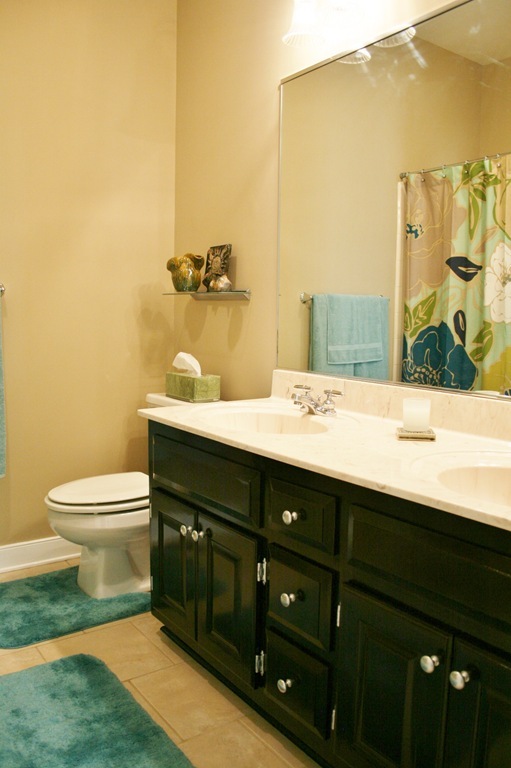 our guests will feel more comfortable using this lighter and brighter bath. Below is a recap of my initial concerns, wants, needs, dreams of what needed to happen in that space. It was so fulfilling to check so many things off the list. I added pictures of the updates along the way. Enjoy! When removing the lights for painting I discovered that what I thought was frosted glass turned out to be dust encrusted clear fluted glass! Insert communal eeeeewwwww! A thorough cleaning and we now have a good bit more light coming through. Although it’s not the best fix for the long run, it works for now. In an attempt to make a positive change on a small budget I spray painted all the gold knobs and even traded out the porcelain cabinet hardware for some of the old brass from the kitchen. A coat of chrome spray paint later and they look like a million bucks! 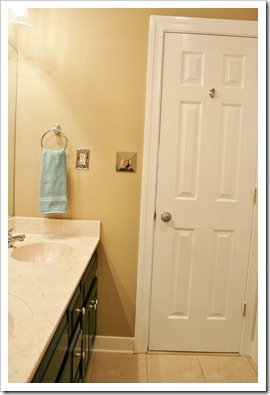 I’m still on the fence about the actual door and closet knobs, though. I’m not in love with the finish and I’m also unsure it will hold up to regular use. Doesn’t matter now. Gel stain made it look completely different. Thank you, Minwax, Red Elm! We nixed this idea in favor of something more neutral. Not only is this a space for guests with varying tastes, but it’s one less space to have to worry about come sales time. As Dave on Storage Wars would say, “YUUUUUPPPP!” The dark color helps hide the years of water damage and chipping areas, making the cabinet look completely new. Yeah! See all the chipping paint and swollen wood above? Not the best presentation for our guests, wouldn’t ya’ say? If we had just removed the wallpaper and done nothing else in this space it would have been a much happier place than it was prior to the changes. Although my Home Depot, “Oops” color ended up being a bit darker than I envisioned for this room, it was actually exactly what was needed. Between the new wall color and the darker cabinet, the vanity looks much more beige with brown streaks than cream with red streaks, as it did before. Framing the mirror is still on the list for the future. In the future we may opt to replace them completely, especially since what we have gives off so little light. For now, a couple of coats of chrome spray paint and the really good shade scrubbing has given them an almost free new life. Maybe I’m just too cheap, but the simple changes we made makes these sort of charming to me now. Where before they seemed brash and old fashioned.??? I removed the shelf, but decided to paint it, put it back and add some different artwork to the wall above. I have yet to find any art for any part of the bath, so I just put back some of my ceramic pieces on the shelf for now. Still on the search for something I like. 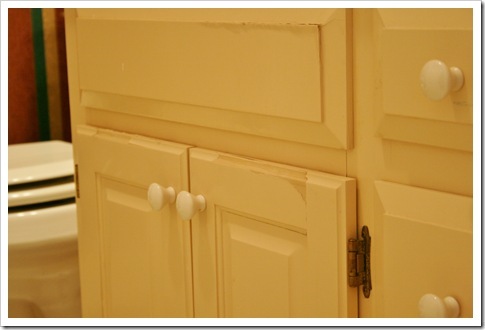 I removed the old porcelain knobs and replaced them with leftover brass knobs from the kitchen. 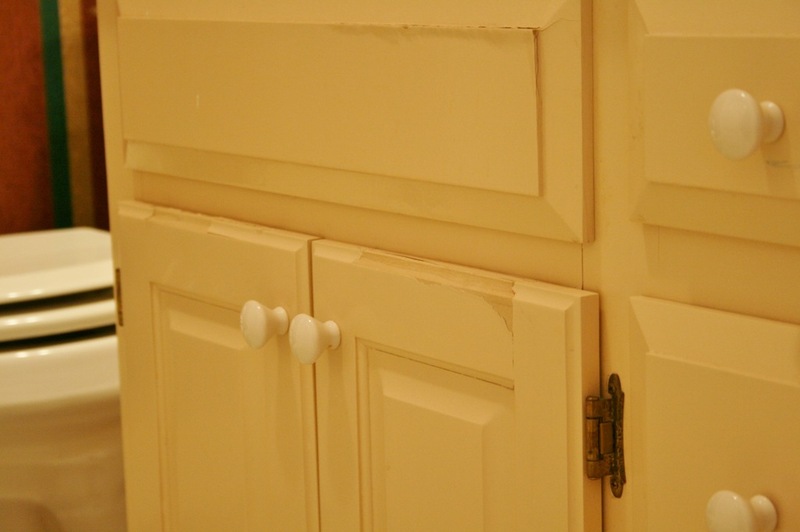 Since the style was identical and I did not have the heart to paint the porcelain knobs, I opted to spray the gold ones chrome, along with the hinges, so everything looks new now. If I had a bigger budget, or one day….. Done! This ended up being so much easier than I thought. Although, adding a extra high bar did not look as nice as I thought it would. I decided to keep a regular height rod instead, which in the end meant I could avoid the higher cost of making (or buying) a custom sized curtain and liner. 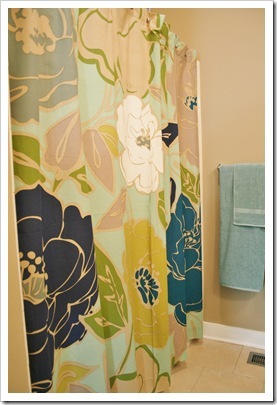 I found the shower curtain at World Market and at $29.99 I believe it was the most expensive purchase for the whole mini-remodel. 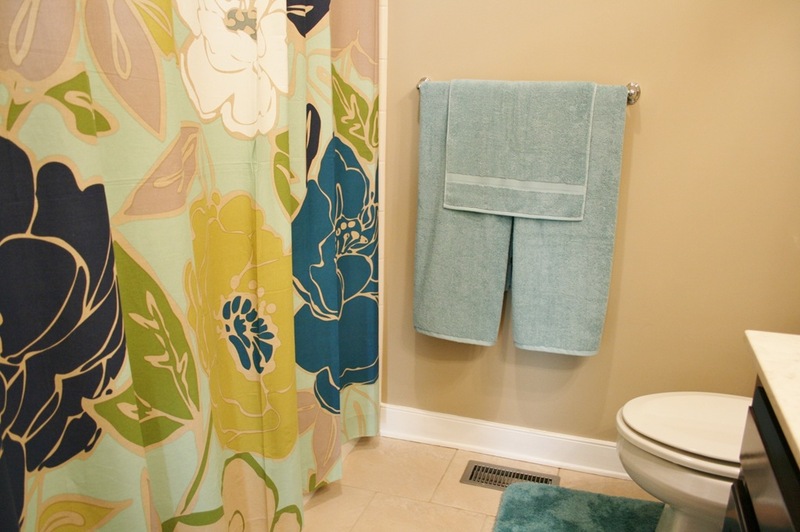 I also added the towel bar after removing the shower doors, which included nice long handles for draping wet towels. Now we have this new chrome version, plus an additional towel bar set in the tile at the back of the shower surround. The new bar is part of a set that I scored during one of my thrifting adventures last year. I thought I would use it in the hall bath upstairs, but found a more immediate need in this room. 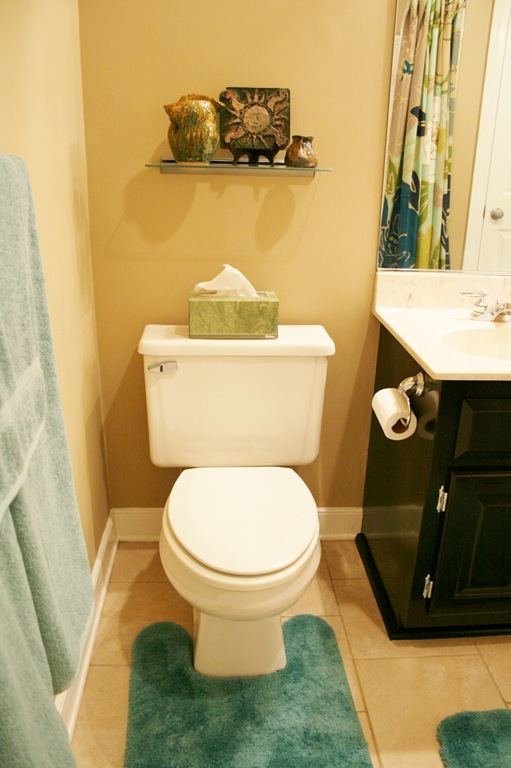 The set includes a more modern style toilet paper holder, which was relocated to the end of the vanity cabinet and out of view when looking into the space, a hand towel ring and a door hook. All this chrome for about $3.50 at 50% off Wednesday at the Salvation Army. Yeah budget! 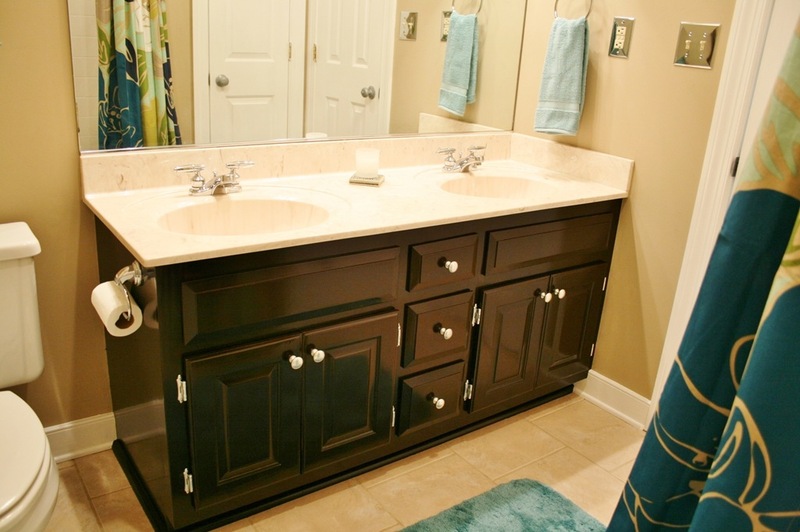 -Would love to remove vanity completely and replace with a higher cabinet (this one hits below my mid-thigh) and a Carrera marble top. Oooooohhhh…. So, this is where we have arrived over the last month with this room mini-remodel. I say mini because nothing structural changed aside from removing the shower doors, which was shockingly easy to accomplish. 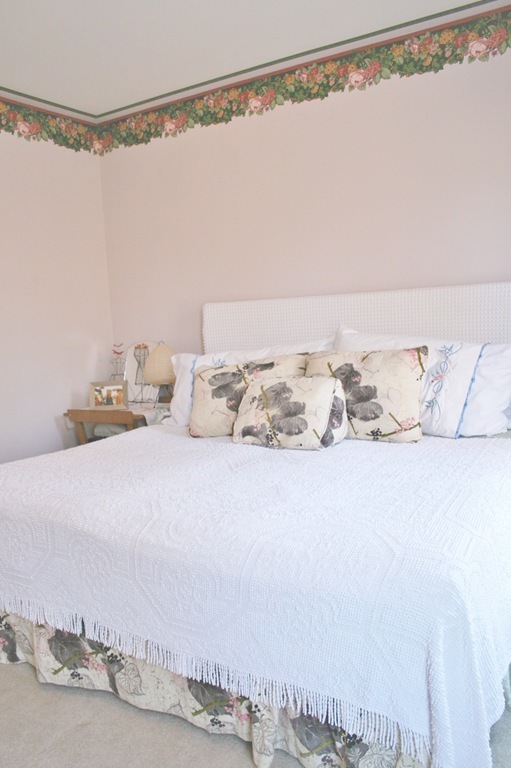 Even though we have simply neutralized the space and did not do anything extraordinary in here, we are quite thrilled with how this room looks now compared to the circus tent of early ‘90’s Waverly wallpaper that it was before. I think our guests will be much happier bathing in this space as well. Considering I have two kid’s rooms to complete on no budget in the next month, I am pretty psyched about how low priced this mini-makeover ended up. It’s amazing what you can accomplish by hitting up sales, keeping a lookout for those oddball, but useful things at the Salvation Army and, of course lots of elbow grease. 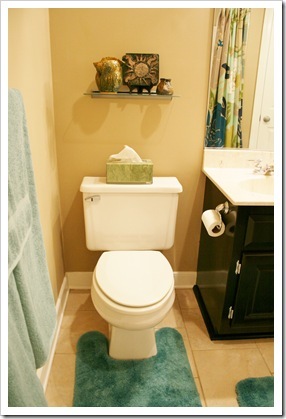 Did you guys make any big or little changes to your bathrooms over the last month? I love to see what other people come up with in their own spaces! Since I’m not big on lugging boxes of décor around for each and every holiday, simply because storage space does not permit it and I just don’t have it in me to go all out for every thing, I thought I would share the couple of things we did add to brighten the house over the holiday weekend. 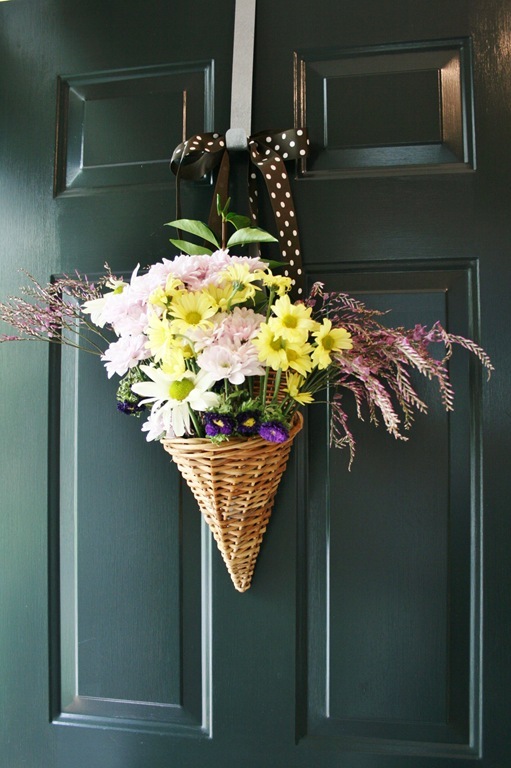 Of course I wanted to have a door greeting for our Easter Egg Hunt guests and anyone else that happened by over the next few weeks. So, I dug up this little thrift store find from last year. 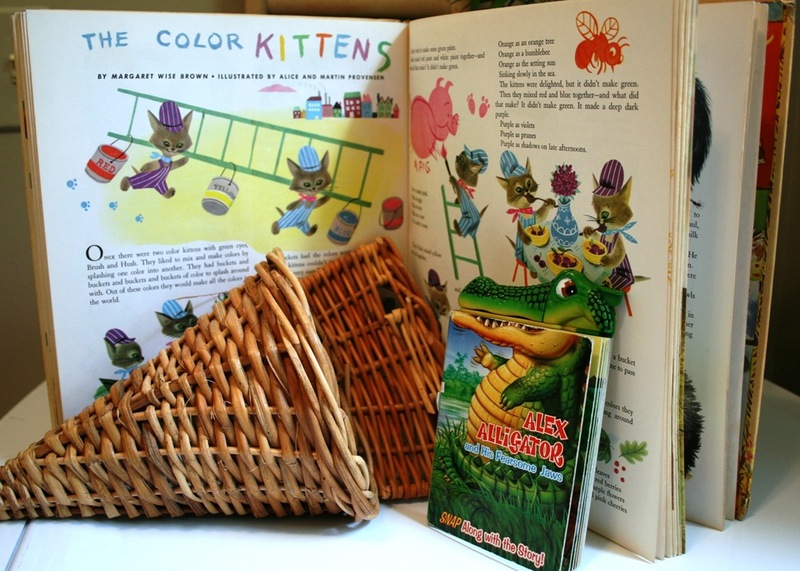 It was a cone shaped basket lined with a galvanized container that only cost $1.99. I used a piece of brown grosgrain ribbon with white polka dots that was left over from a sewing project I shared over here to make a hanger. I just slipped it through those holes along the top of the backside and tied the ends into a large bow. 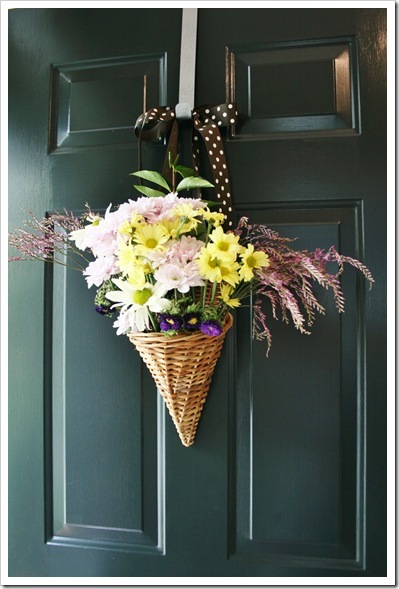 A $10.00 bouquet of spring flowers later and wholla! Don’t you just love purple and yellow together in the spring time? Ahhh, fresh! Okay, so I have to chuckle a little now because we really did not do a lot of decorating around here at all. 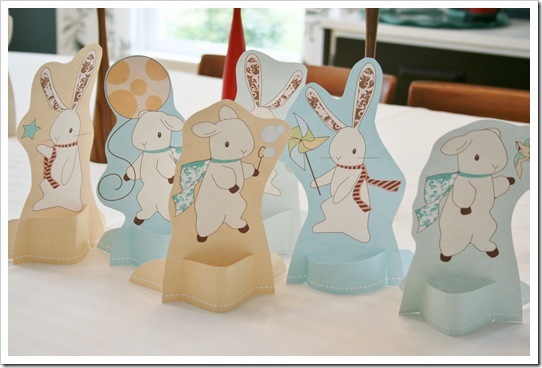 Aside from the flowers on the door and the fun treats that I mentioned last week for the egg hunt, the only other thing I managed to do was add some cute cut-outs to the dining room table. I was not sure if our group would end up congregating in the dining area or just in the kitchen at our smaller table, so I wanted to put something slightly festive in there as well. I found these really sweet free downloads over at The Handmade Home. She puts these out monthly and they are meant for framing, or I guess whatever you want to do with them for your own decorating needs. We, yes the Little Guy helped pull them off the printer, printed out the lambs and bunnies along with the latest creation, these chickadees, pictured below. Ta-Da! 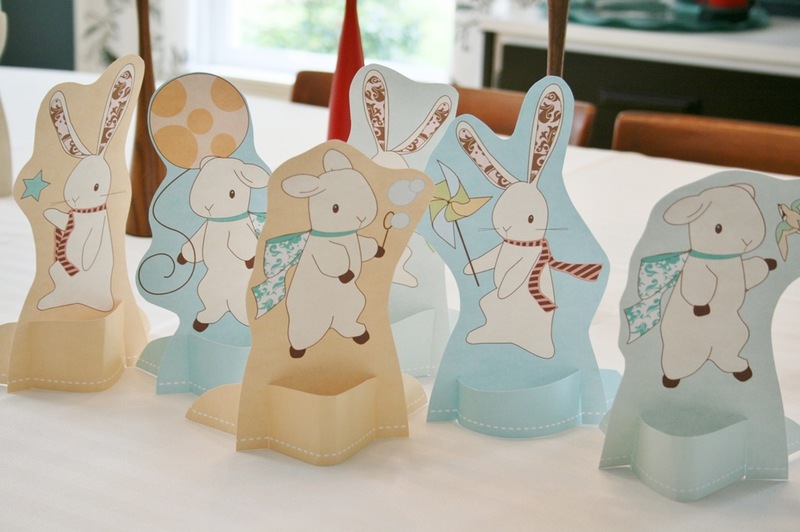 Cute spring animal cut-outs, stand-ups, whatever you want to call them. 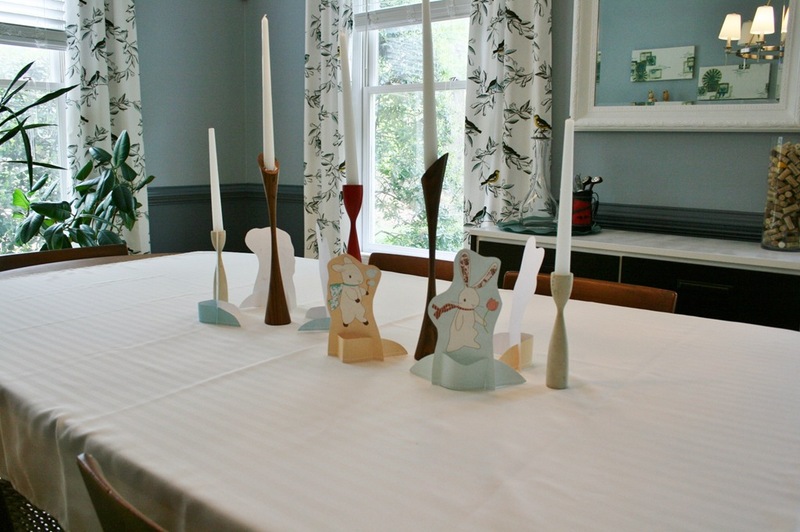 I just placed them around our usual candlestick display along the center of the table. I had meant to send each child home with one, but we never really ended up using this space that morning. Oh well, I guess I will have some cute little animals for next spring too! We had intended to drape a piece of crepe paper along the opening between our family room and the kitchen for fun. Then we were going to add sized down cut-outs of the chickadees along the strip, but our first guests arrived before we could even get the tape out. Wuh-wah! Oh well, like I said things were simple and to the point around here for the holiday. ;o) Hope you guys did something fun to get in the mood for spring and Easter! 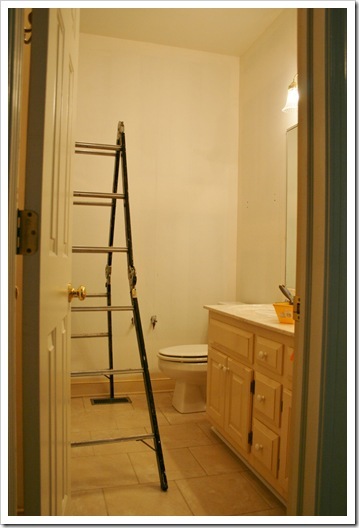 DIY : Guest Bath Room - In Progress : Lighten Up, Why Don’t You? So, the color is up and my first worry, that it was to similar to the orangey trim color, is a thing of the past. At first I was getting an overwhelming orange poo-ish sort of vibe, but as the color dried and darkened it definitely took on more of a chocolate milk look. It’s difficult to see a true color in any of these shots due to the bad lighting in the room. Plus, I had The Mister take down the lights above the vanity so I could paint more easily and that has created all the brightness and comfort of a cave in there. It’s amazing that I haven’t managed to get paint every where but on the walls during this paint job. 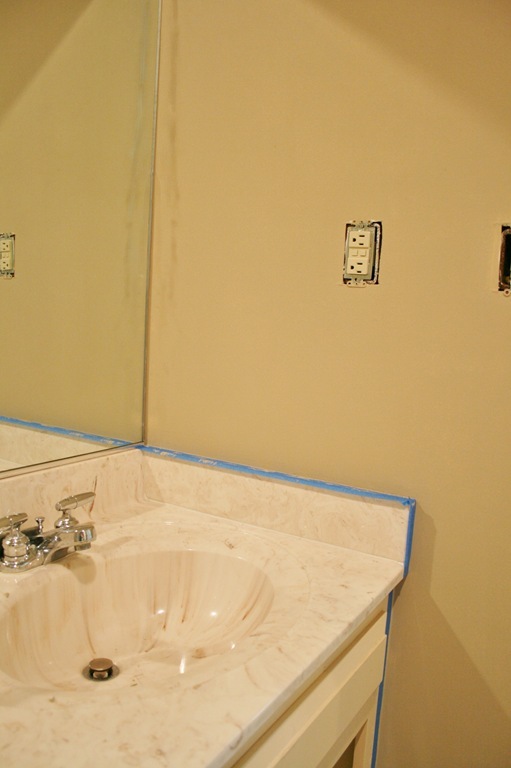 Next to the vanity, the color is definitely not to orange based- YEAH! On the other hand, the color is much darker than I thought it would be. Don’t ask me why I thought it would appear lighter. I am starting to think I might need to have my eyes checked. …so I guess I should be happy with the changes so far. 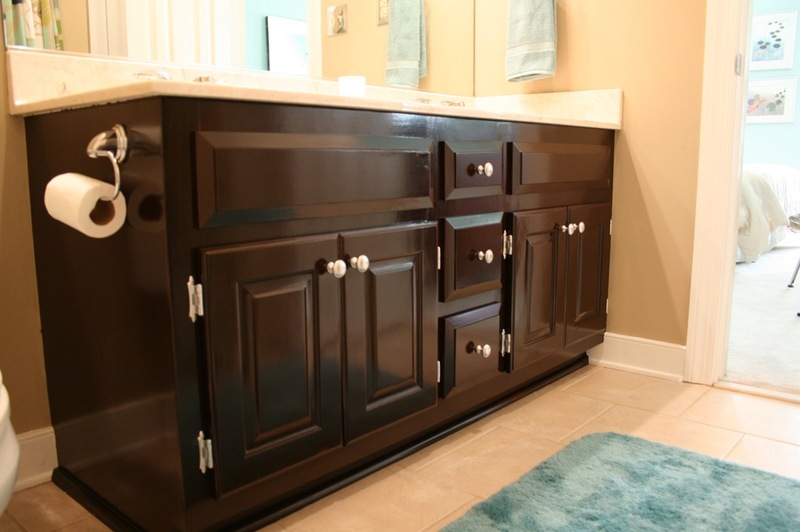 On another note, we convened about the vanity color and it was decided to use gel stain and go dark. 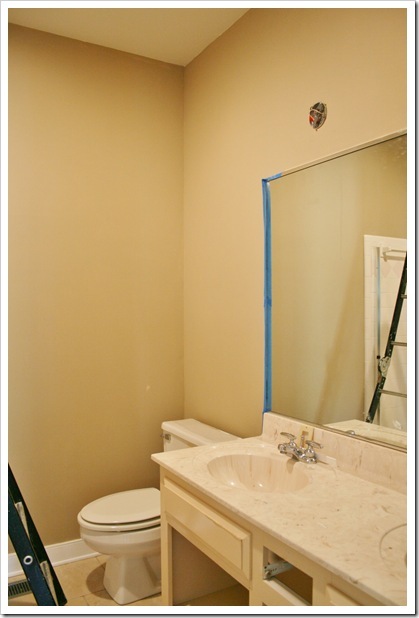 My only concern now is that between and really dark vanity and the darker wall color we will end up right back where we started; a room without a view in a basement. Since my pregnant body is not withstanding much physical activity this time around I am praying the color choices go over well with the hubs and I can wrap this project up over the next week. Let’s face it, we can always paint the walls again another time if we never warm up to the color and it’s much better than the posh circus tent we had before. 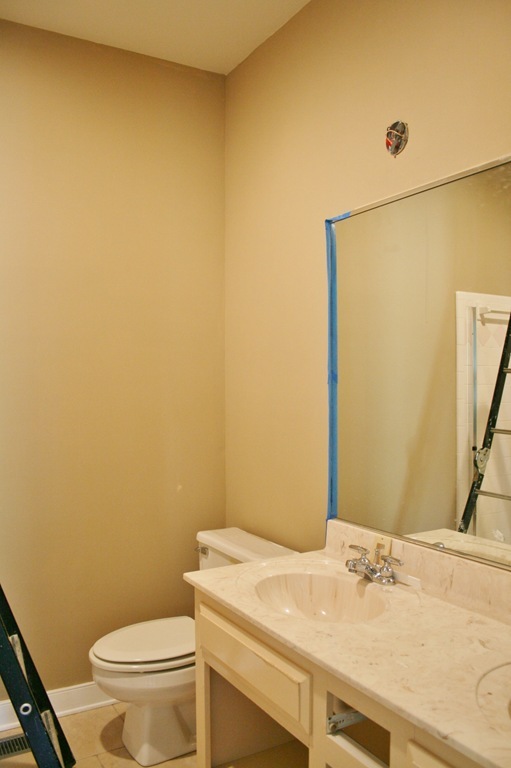 As I reported last week, the guest bath remodel/makeover is underway. After very little discussion with The Mister (he worked most of the weekend) I have decided to move forward with the beige wall paint, white trim and darker cabinets. I am considering antiquing them first to see if I like it. If not, then I will move on to full coverage with gel stain. 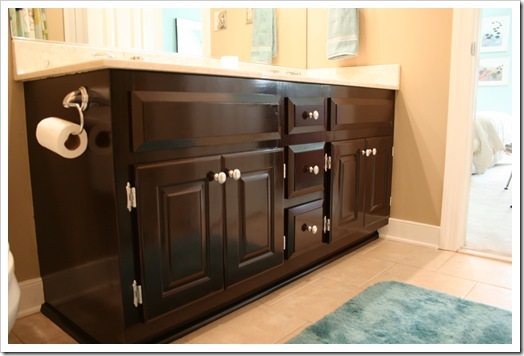 I believe a nice, deep stained look to the painted cabinets can go a long way in a newly brightened bath. We will just have to see. 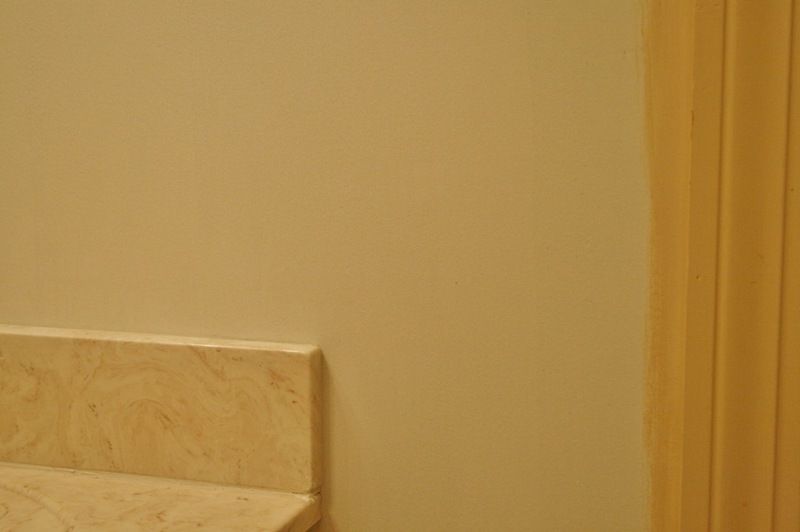 Right now the wallpaper paste removal is still a work in progress. More on this project later. I have been sidetracked in my remodel planning process since last Thursday. That is when we found out our new little one will be a girl. Yeah for a swing with a different bat this time around! Yikes, for all the newness and challenges we face. All in all we are super excited. 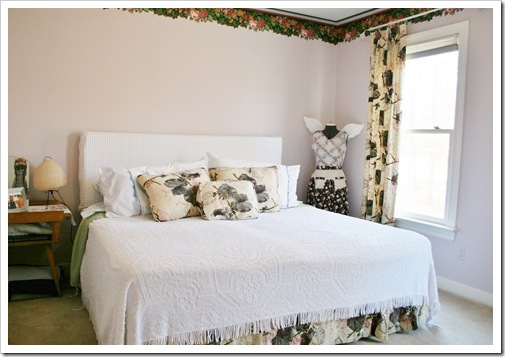 But, of course that brings us full circle to a grand bedroom remodel. I knew the spare bedroom had to move from lavender and flowers to something a bit more in tune with a very young boy, but I still was not sure much needed to change in our nursery. Now it looks like we need a complete overhaul! Actually, I am thinking of some subtle changes in the nursery, as well as the spare room. Even with the small things that need to switch up, I am utterly exhausted just thinking about all that has to happen between now and the due date. AAAAAHHHHHHH!!!! Again, my sidetracked mind can only seem to focus on the next fun project that lies in wait. I have been searching Pinterest for inspiration, but I think I have a pretty good idea of how these makeovers will go down. One thing is for sure, the Little Guy’s bedroom will soon house a lot more of his toys, as well as, his pint-sized table and chairs set from IKEA. Which, by the way, is looking really rough now that it has even more scars from the Crayola battles. 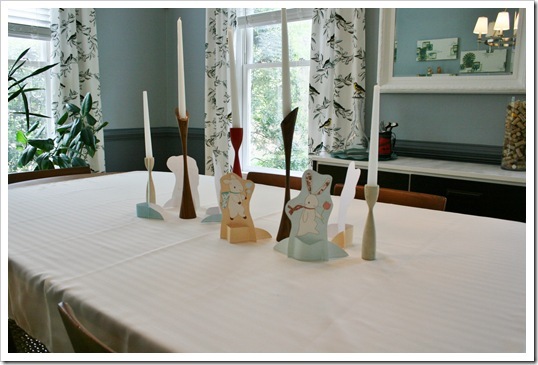 Sir Google brought up some neat images of how other people transformed their IKEA table and chair sets, so I think before popping our sad set into the new space I will give it a quick makeover too. A little too sweet for my guy, but in the realm of possibilities. With all the marks on top I’m afraid there may be bleed through if I just paint. The idea of actually covering the top with paper or fabric seems like a better bet. Very cute idea and I love that the writing supplies are contained. Not sure that chalk is something I want all over the surface all the time, though. Plus, I was planning a chalkboard so…. Nice, simple, straightforward. Just paint it with nice colors and a cool pattern. I really love this idea a lot and had planned some similar wall art for the nursery that never materialized. Even just a map decoupaged in place would be pretty cool. This last one is really fun and the before shots look quite similar to our set. The only thing is my Little Man would rip every last bit of this masking tape right off in one sitting. There are plenty of ideas out there, I just have to pick or come up with one. And, soon! 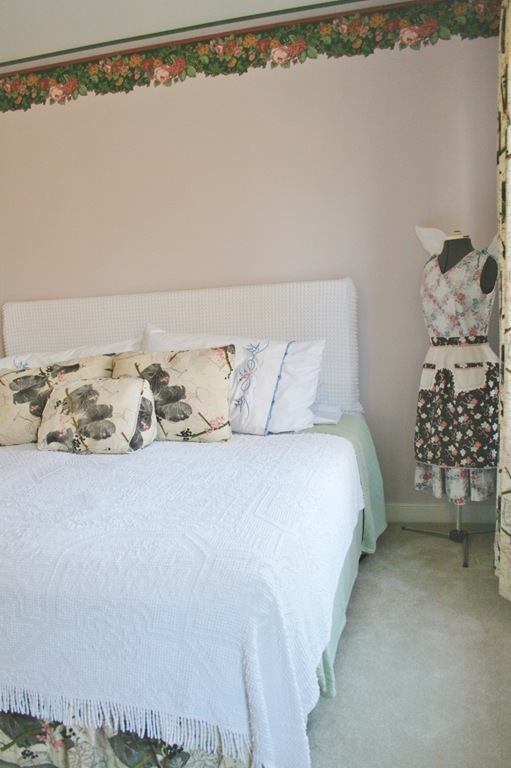 We have walls to paint, bookshelves to find, beds to upholster, pillows to make, lighting, window treatments. As usual, I am biting off waaaaayyyy more than I can chew! Say a little prayer for me, ‘kay? …in a matter of about 20 minutes the other day. Initially I went in to test the strength of the border. 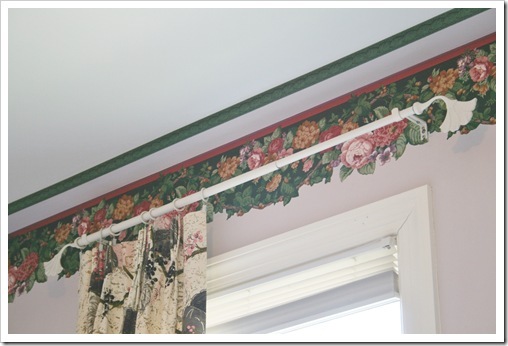 Due to the painful process I went through when removing the wallpaper in the dining room, I had almost convinced myself that I could pull the border down and then paint right over the rest of the wall. Yes, I know this is not the right way to attack this kind of problem. 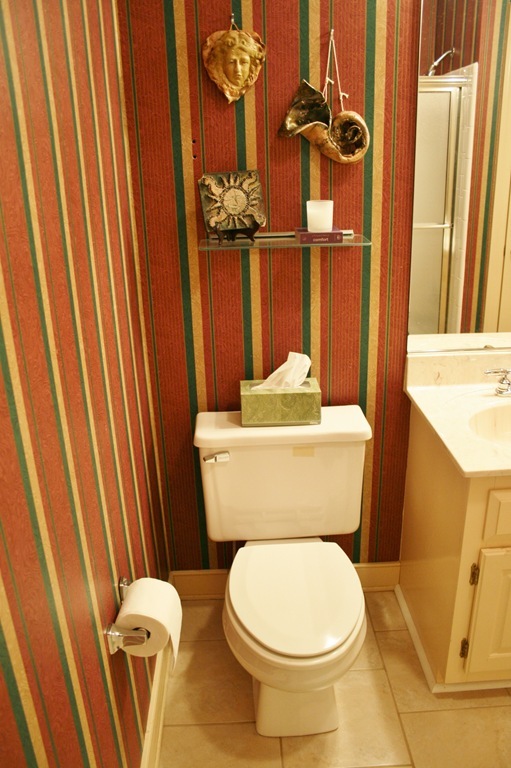 But, hey, when you have seen the other, very ugly side of what can happen when wallpaper won’t come down easily you start to consider all kinds of crazy things. My first test strip pulled an entire sheet of the vertical paper from the wall. It looked like I was in it for the long haul. Lucky for us the rest came down with ease. The Little Guy even helped pull down the low pieces and had such a good time being destructive that at one point he stopped to tell me he was having fun. It was at that moment I realized I could no longer discuss any other wallpaper removal plans with him. I could already see him scratching at the seams in the other bathrooms of our house. I really need to take these projects in stride, ya’ know? My stride, not his. So, we are down to the dingy white walls and I have already started scraping the paste away. For those of you wondering about the process I am following and especially for any other pregnant DIYer’s, here it is. I am using a handheld spray bottle that I fill periodically with the hottest water I can get from the tap. I mix that about 3 to 1 with white vinegar, spray it on and let it sit for about a minute. Then using a large blade drywall scraper/trowel thing (yes, that is technical terminology there) I slide it right off the walls and into my drywall spackle tray. Yep, those things come in handy for all kinds of things. My first go at it started only minutes before the end of naptime, so I had to work fast. I was able to clean a pretty good sized area very quickly. 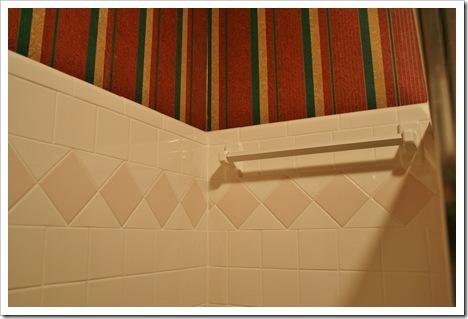 I only have the high spots above the tile around the shower, and the area above the mirror left. I figured the area above the mirror will be a juggling act of not electrocuting myself while spraying around the lights. I’m currently trying to develop a plastic bag and tape arrangement to help keep the vinegar and water from getting to the wires. Hopefully I will get through that area this weekend and on to painting. Yeah! But, that is where the fun stops. 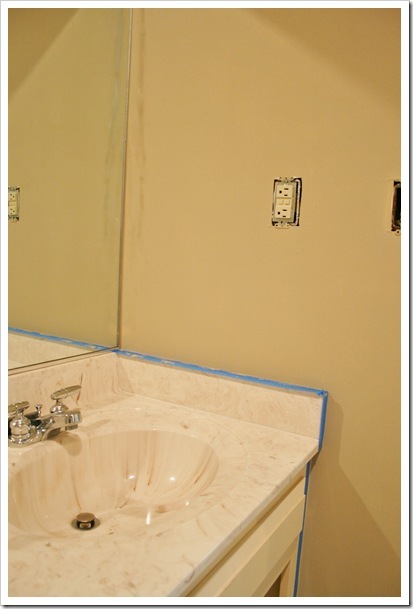 I grabbed a gallon of cheap-o mismatched paint from Home Depot a while back in a light beige color and after taking another look at the beige trim in the room, along with the lovely cultured marble vanity top, I’m worried it might be all wrong. 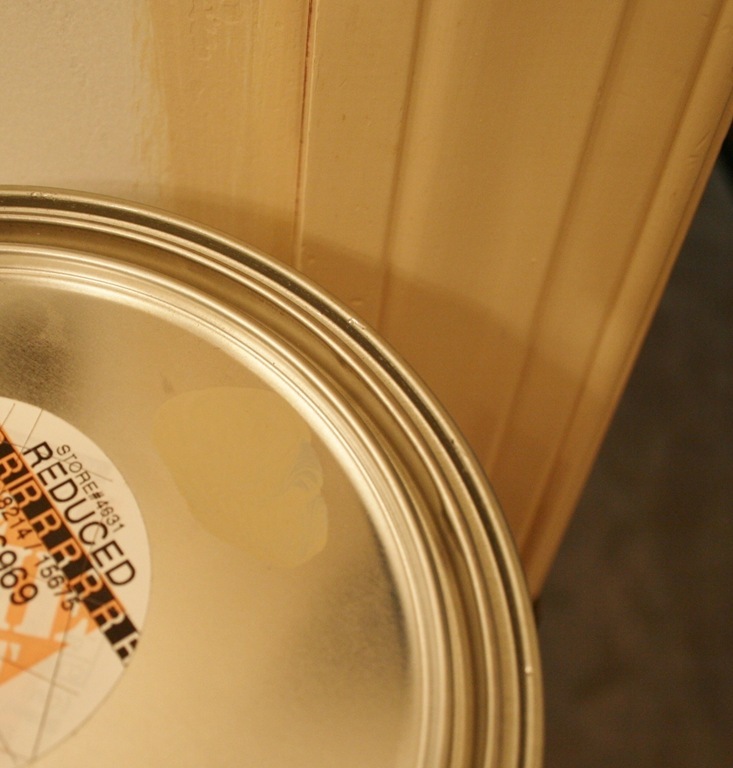 Although the trim will be painted white I’m a little scared of the similarity between my new paint and the old trim color. 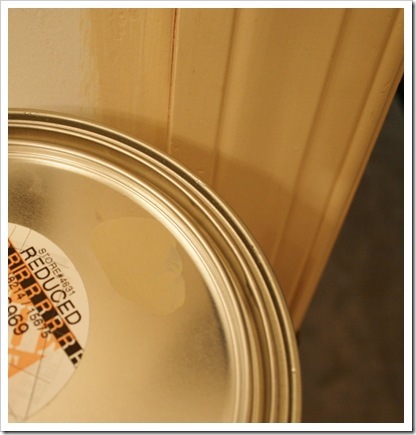 I was thinking of going neutral with the walls since nearly every surface is a different shade of white or cream. I know that’s pretty boring, but until that vanity top goes I cannot mask the ugly orangey-cream elephant in the middle of the room. 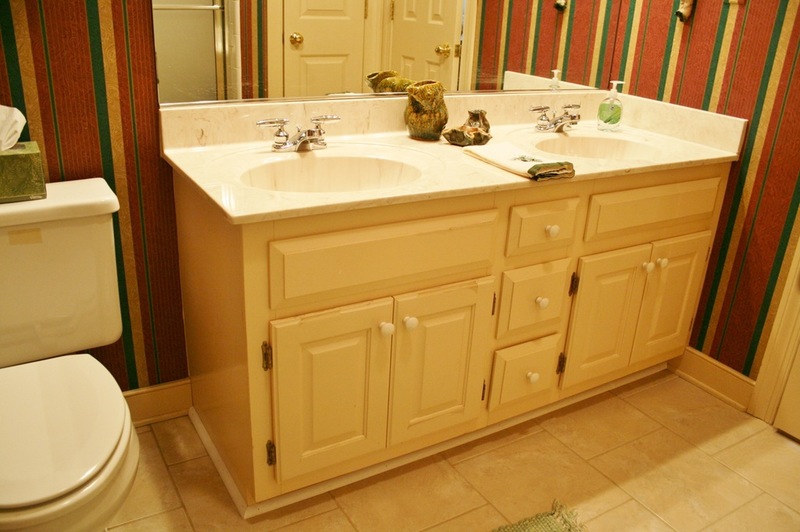 That’s also why I was thinking I might do something fun with color on the vanity cabinets, but I think The Mister might veto that in favor of more neutral. Wuh-wah…. We will be conferencing again over the weekend on this topic. We plan to have a memo out early next week on the next steps to this ongoing process. With my million-things-to-do list increasing daily and a large portion of those items hitting deadline at the end of the first quarter I am slightly freaking out with the coming of March 1st this week. Thank God for that extra day in February with leap year, right? 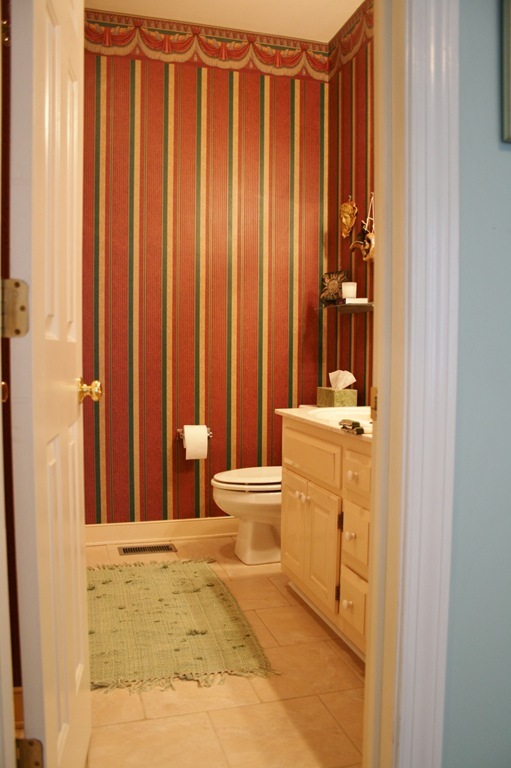 Phewwww… Anyway, I am itching to jump into several room re-dos, but promised myself I would at least remove the wallpaper from our guest bath and kitchen before moving on to any upstairs areas. Mainly because, aside from a much needed paint job in the family and guest rooms, the downstairs is in slightly less need than the extra bedroom upstairs. Although banishing the lavender wall color in there before I transition the Little Guy over into his “Big Boy” room, is a non-negotiable. So, I will be getting to that room ASAP. 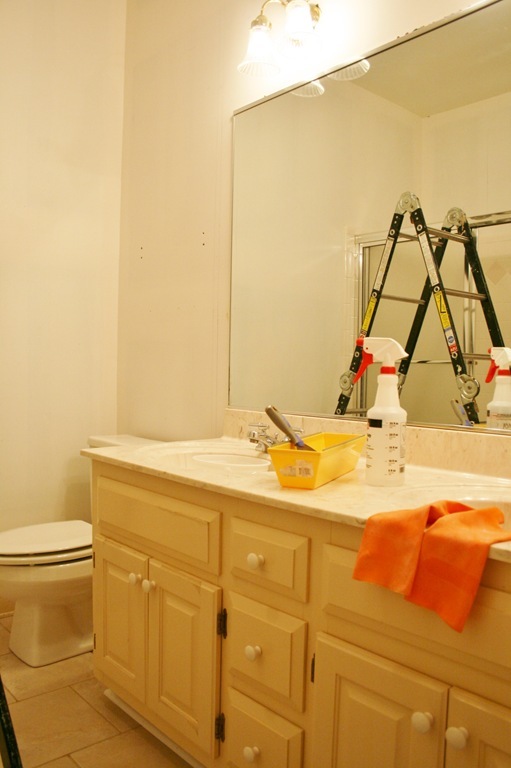 With my last attempt to remove wallpaper and paint being so disastrous, I decided to ease into the process and start with the smaller of the two rooms; the guest room bath. Now is your chance to really have some fun at my expense…literally! Here is where Waverly met the early 1990’s in the worst way possible and you get to laugh at it, with me hopefully more than at me. In the immortal words of Missy “Misdemeanor” Elliott, “Let me show you what I’m werkin’ with”. This first shot is just to give you a basic feel for the shape of the space and to show the wall color of the adjoining guest bedroom. Although the walls in the bedroom desperately need to be touched up the color is a nice pale blue, sort of a hint at a Tiffany’s gift box, and more like the look and feel of the rest of our home. 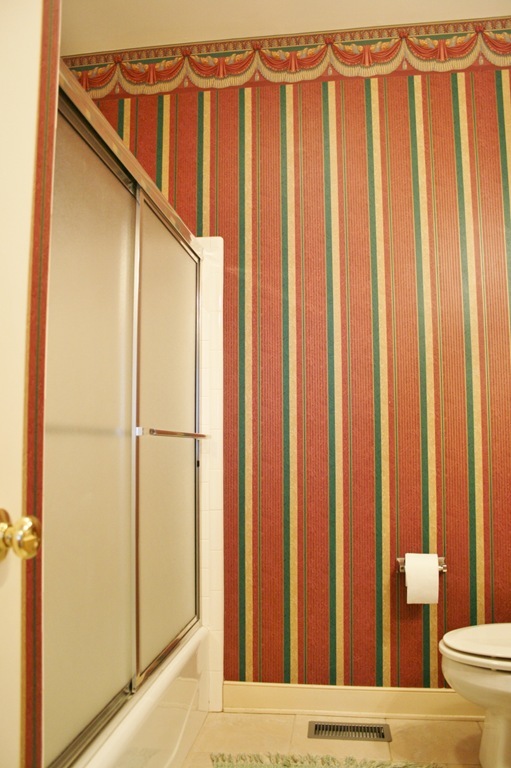 I believe it was the previous owner’s attempt at diverting your attention from the ghastly ‘90’s throwback wallpaper that still lingers in certain nooks and crannies. For funsies I think we should get right up and personal with that lovely wallpaper. 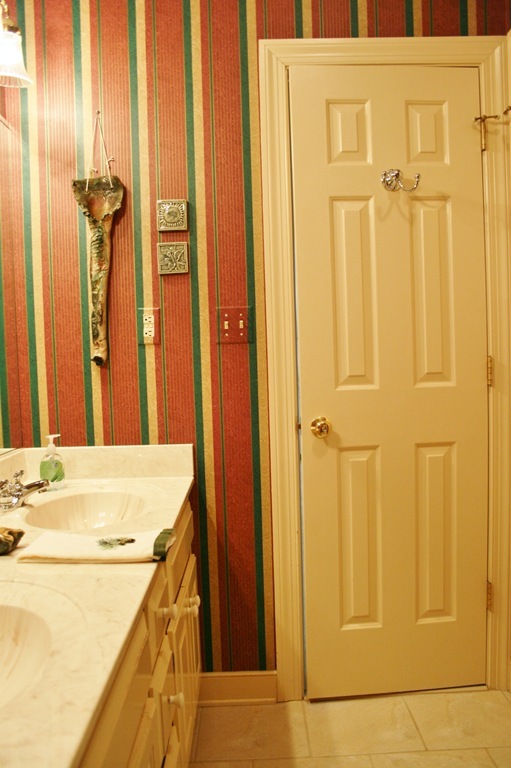 It’s difficult to tell in a photo, especially with the bad lighting in this room, but the walls are striped in deep maroon, hunter green and gold. 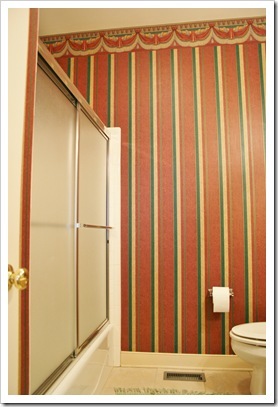 The stripes have a sort of swirled under pattern that I believe is there to mimic moire’ fabric. MMmmmm…. Then of course, there are the over the top golden swags, embellished with flowers and holding heavily fringed thickly draped fabric. So, bee-uti-fullllll….NOT! What kills me is that this is the only room in our entire house that does not receive any natural light and it has some of the darkest wallpaper imaginable. That = crazy! Now I will bring you a bit closer to the fabulous vanity. It is actually quite nice as far as the size goes. 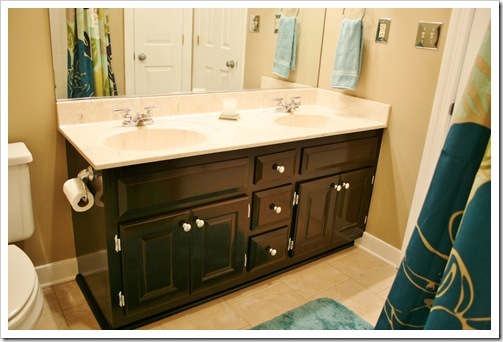 Deep double sinks with a good amount of space around the edges and in between. For a change it is nice to live in a place where you can set the curling iron down to wash your hands and not risk death by electrical shock. 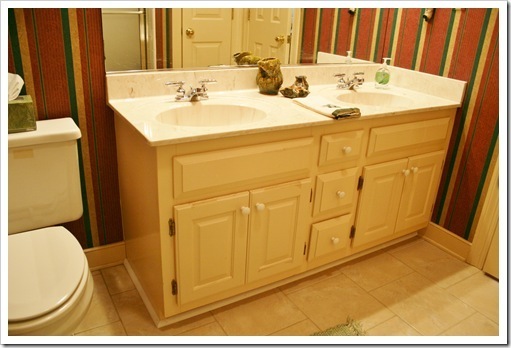 There are three decent sized drawers in between the sinks and below each, a double door cabinet for plenty of storage. While the faucets boast a chrome finish the cabinet hardware is white porcelain, which contrasts nicely with the creamy beige chipping paint and tarnish-blackened hinges. But I would say nothing tops the cabinets like cultured marble in yet another shade of creamy beige, flecked with deep maroon. Oh, but wait! 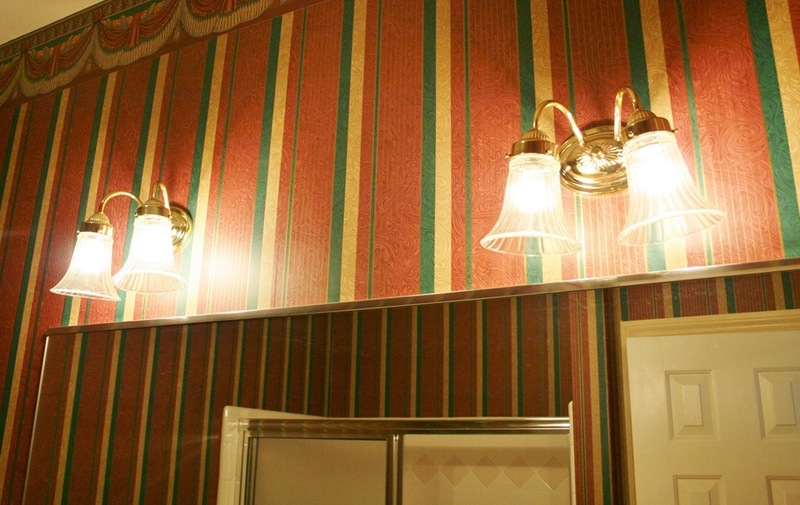 There are these super shiny brass sconces perched high above each sink. 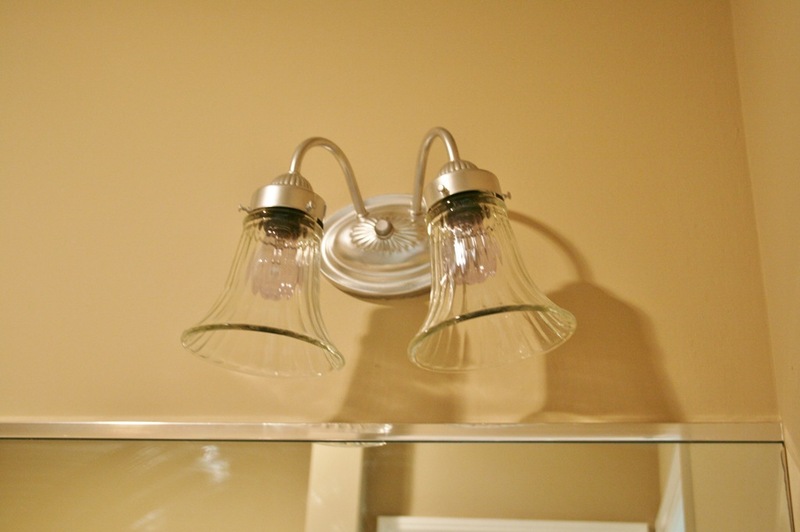 Not only are they, well, brassy, they give off very little light. Especially for FOUR lights! At the end of the double vanity we come to the toilet. Pretty standard issue. The only thing goofy with this is that it appears to be in a shade of white, rather than cream or beige like the vanity top. ??? Above the toilet I placed a display shelf shortly after moving in. 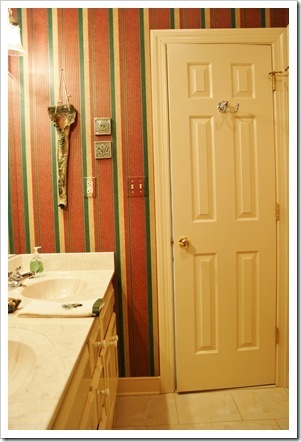 The little glass shelf was crammed into our powder room, appeared to serve zero purpose and had a bright brass look to the metal support bar. 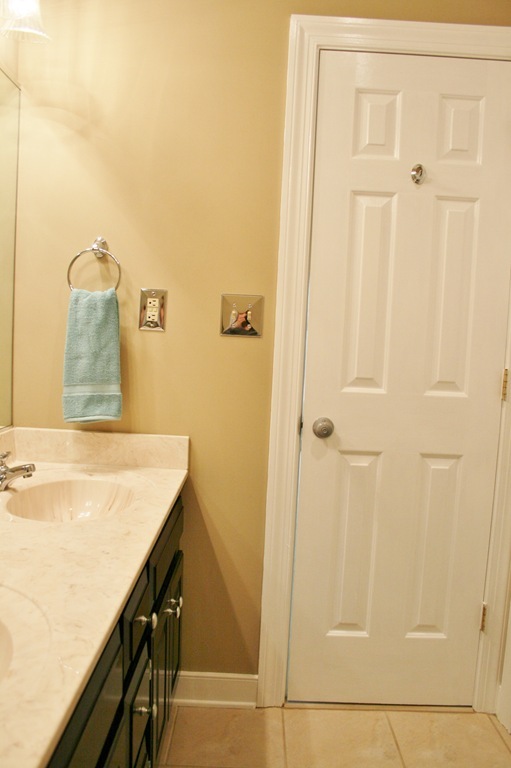 A quick spray of hammered nickel and it worked to camouflage the holes left from the really posh cream colored plastic towel bar that had been hung at an oddly high point behind the toilet. 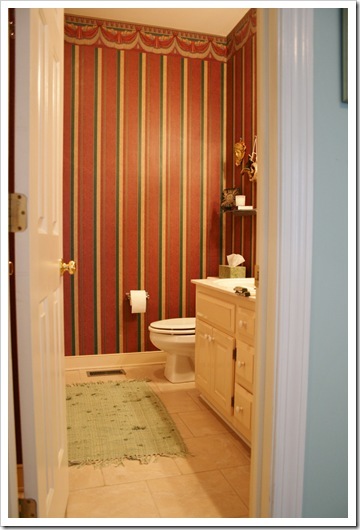 Oh yeah, here is another look at the circus stripes and around to the shower/bath combo side of the room. 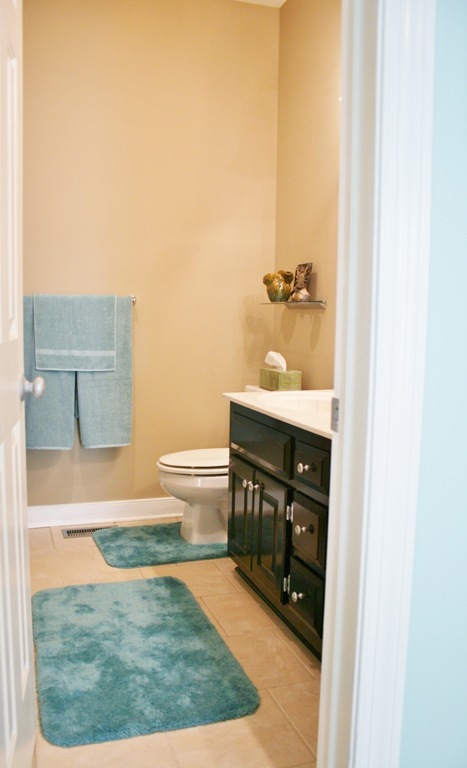 Both the downstairs guest room bath and the upstairs hallway bath have sliding shower doors. At least these fixtures are in chrome, although my preference would be to remove them and just put up a bar and nice curtain. 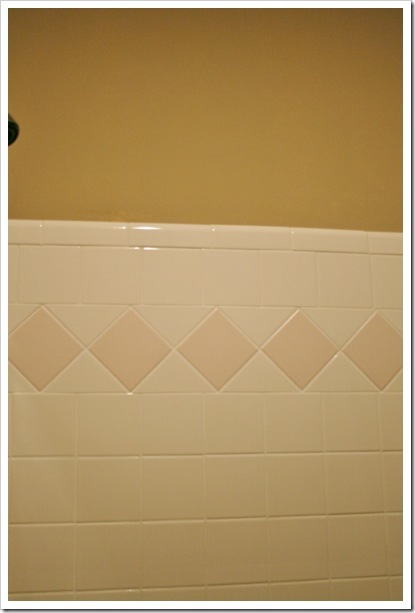 At the bottom of the picture above you can see another lovely color combo of cream colored tile against a white porcelain tub. Again ?????? 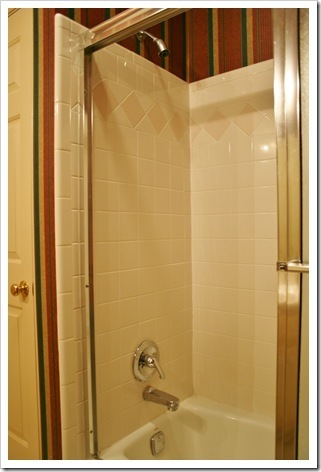 But no expense was spared in adding accents to this bath/shower combo! 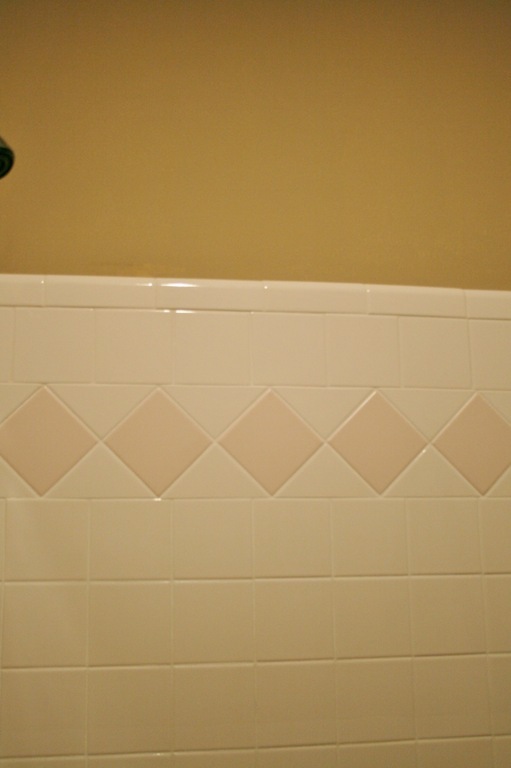 No, a lively diamond pattern in pale pink was added to jazz things up. Because, you know, pale pink goes with deep maroon, hunter green and gold. Oh yes, and about six different shades of cream. Right? Swinging around, the tour ends with a look at the nicely sized linen closet that hides behind the bathroom door, plus you can see yet another shade of creamy beige in the floor tiles. Oh yeah, and if you look closely above you can also see more gold knobs and hinges mixed with a chrome door hook. I cannot wait to get these stripes out of here. My only problem now is deciding how to tackle this project. I could go in so many directions. Now that I have put it out there, I guess I better get busy, right? What DIY projects have you guys been working on lately? Any suggestions for our space? Remember we are on a super tight budget and will have to make due with mostly paintable changes right now. However, all suggestions are welcomed!